This recipe for Croatian soured cabbage heads (sauerkraut) is known as kiseli kupus (KEE-seh-lee KOO-poos), the leaves of which are used to make sarma. It's getting increasingly difficult to find whole heads of soured cabbage (Kissel's is one brand to look for, Marco Polo brand sells jarred leaves), so families get together to make a large batch to share. This recipe is from "The Best of Croatian Cooking" (Hippocrene Books Inc., 2007) by Liliana Pavicic and Gordana Pirker-Mosher. The horseradish and red peppers in this recipe give it quite a zip. Wash cabbage heads and remove any tough outer leaves and reserve. Core each cabbage and fill with salt. Place 1 layer cabbage heads, core-side up in barrel or crock. Add some of the garlic cloves, horseradish, red peppers (fresh and dry), and bay leaves. Place another layer of cabbage heads in the barrel and another portion of vegetables. Continue this way until the crock is full. Cover with reserved cabbage leaves. Fill barrel with as much water as it will hold without spilling over. Place a clean cotton or linen cloth on top of cabbage and then a clean, untreated wooden board. Weigh down with a heavy rock or another item, to keep the cabbage heads from rising during the fermentation process. Store the barrel in a garage or fruit cellar, or place that does not fall below freezing, on wooden skids off the floor. You may want to wrap some insulating material around the barrel if you live in chillier climes. The cabbage should be ready in about 40 days. Keep the brining water clean by skimming the foam off the surface with a slotted spoon or sieve (foaming should start in about 10 days). The soured heads can be frozen for later use or canned. Before using kiseli kupus, you can rinse the leaves, if desired. 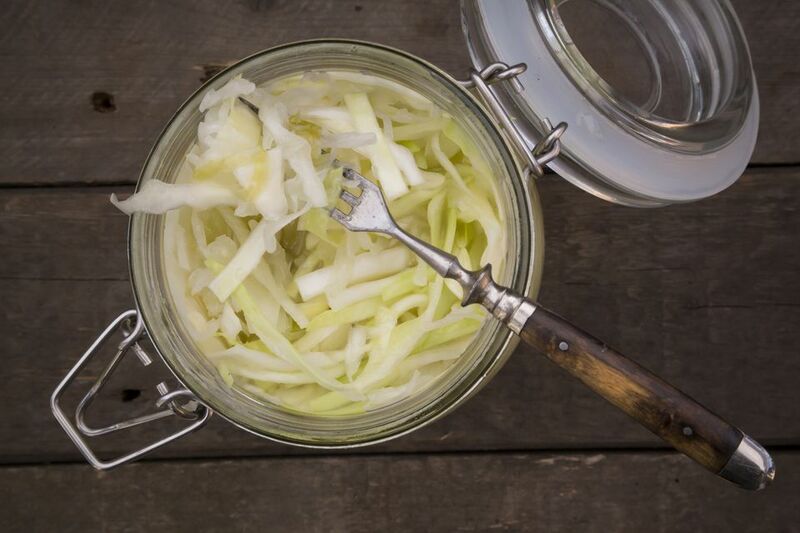 Chop them for any recipe calling for sauerkraut. If you don't have a large enough barrel or crock, the cabbage can be divided among smaller barrels or crocks. Beets may be added to give cabbage a red color. Adding chopped quince will give a yellow color.